Shortly after Clarissa and I got engaged, everyone felt obligated to suggest that we do the wedding entrance dance. After being sent the same link several times, it just wasn’t funny anymore. I am now positive that I will be clothed when I walk down the isle. I had heard of a sample wedding dress sale from a friend of the family at church and decided to check it out with my mother Kathy, sister Natalie, friend Katie, and soon-to-be-mother-in-law Donna. The place we went to was a medium-sized dress shop called Glenrose Bridal. The shop was probably half the size of a David’s Bridal, but it was packed with dresses. The first thing my fitter, Lisabeth, did was hand me a clipboard to fill out my name and other information. My mom, sister, Katie, and I got to walk around the shop looking at dresses. (Donna came a little later when I was trying on dresses.) As I looked at dresses, my family and Katie kept calling me over and asking, “how about this one?” It was a lot of fun. At first, I was timid and, not being totally sure what I wanted, couldn’t tell them exactly what to look for. However, after seeing a few dresses, I began to get an idea of what I wanted, and soon we had five or six dresses on the rack in the dressing room. Finding the dresses was fairly simple. I just said yes or no and gave a reason. Trying them on was more difficult because wedding dresses must be put on in a certain way so they don’t get ruined and the wearer doesn’t get all tangled up. First, I had to find the bottom of the dress. This was difficult with a few of the dresses. Some of them had LOTS of crinoline underneath. Lisabeth told me that to find the bottom of the dress, I should reach my arm through the top of the dress while it was on the hanger. After finding the bottom of the dress, I unhooked it from the hanger. Then I lifted the dress and let it “slide” over my head and fall down the length of my body. There was usually some wiggling involved. At one point, I had to have someone come in and help me pull the dress on. After that, someone had to help me lace, buckle, or zip up the dress. Wearing a dress that laces up is quite a process. The first dress I tried on was one my mother had picked out, and also happened to be my favorite. Of course, I tried on the other four or five that were there, but I still liked the first one best. My mother, Natalie, Katie, and Donna all really liked that dress, too. As I was standing on the podium in front of the mirror, Lisabeth informed me that I was the first woman to try on that dress, which surprised me because it was a sample dress. After comparing my top three favorite dresses, I picked the first one I had tried on. I bought the dress that day along with a simple but elegant veil. Clarissa and I have had our wedding party selected for some time. We considered asking some of our friends. (We have a number of great friends from whom to choose.) However, when it came down to it, our siblings could not have been more appropriate. Clarissa and I, along with all five of our siblings, went to St. Raphael’s School for the majority of our K-8 education. Colette and Chelsea are in the same grade, and Ben and Matt are only a year apart. In addition to that, we always saw each others families when we went to Mass at St. Joseph the Worker. 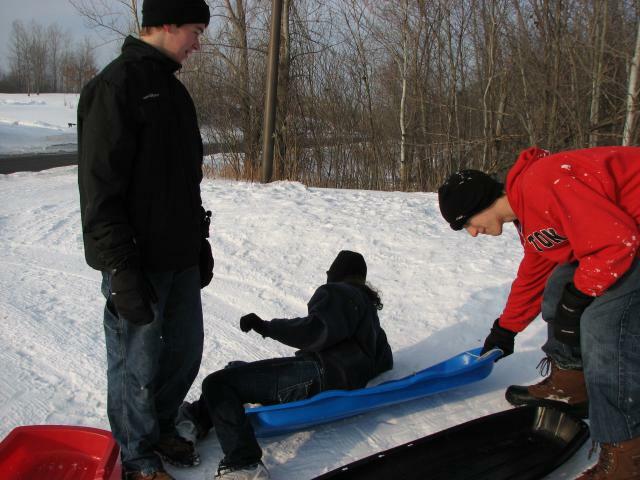 We even organized a Lund-Kampa sledding event at French Park in January of 2008. (We get along just like family as you can see in the picture below.) Family has always been important to us, and we are honored that our five siblings will be playing such an important role in our wedding. Matt dumps Chelsea out of a sled while Ben laughs. Zachary wanted his proposal to be a surprise, but he also wanted to let me pick out my own ring. He got a “proposal ring” for that night, and later we went to visit Jared’s to look at engagement rings. It took us a few stops at Jared’s to find the ring we wanted, and by a few I mean six. Every time we went to Jared’s, I’d say, “well, maybe I like this one better.” I couldn’t make up my mind! One of the hard things for us was not necessarily the engagement ring, but the wedding band to go with it. If the band didn’t come with the engagement ring, we had trouble finding one that would work well with it. Jane, our sales associate, was very patient with Zachary and me. On one of our first visits, we found an engagement ring that both Zachary and I liked, and we even found a wedding band that went pretty well with it. We wanted to think about it a little more, so we had Jane write it down, and we said we would come back. The next Friday that Zachary was home, we went to visit Jared’s again. While we were waiting for Jane to pull out the rings we had looked at before, we browsed the other engagement rings again. Of course, we found another ring that we liked. It had four little diamonds on each side of the mounting. It was simple yet elegant, which is exactly what I wanted. We had Jane pull this new ring out as well, and I tried both rings on. Zachary and I ended up deciding on the new ring and found a very nice wedding band to go with it. The wedding band has a row of 12 small diamonds on it, and it looks perfect with the engagement ring! Just to be sure, we said we’d come back tomorrow. Saturday, we made the purchase, and Jane gave me the wedding band, and I gave Jane the proposal ring. Jared’s removed the diamond and the mounting from the proposal ring placed it into the engagement ring. After church on Sunday, we picked up the engagement ring. This is of course old news now, but it is something that I wanted to document and share with those who have not heard the whole story in person. 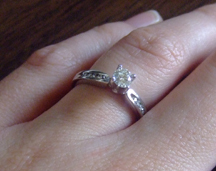 I had originally planned to propose on August 14, 2009. Therefore, when the middle of June rolled around, I planned a trip home to see Clarissa and my family, and I called my mother up and asked if she would like to go engagement ring browsing with me. She agreed, and we decided that the last day that I was home, Sunday, June 21, should work well. I had a nice weekend at home, and on Sunday, my mother and I went and checked out the Jared location in Maple Grove. We were greeted by a representative named Jane, and she explained the different options and helped us browse through some different diamonds and bands. 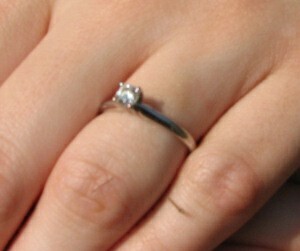 That day, I looked at a nice Leo diamond and a simple solitaire band that I liked, and I knew Clarissa would like, too. Jane was no pressure, and since I did not want to buy that day, she wrote down my contact information and the stone and band information. Then we left. I knew I would be back home to make the purchase before August 14. Then the beginning of July rolls around. It has become clear that I am not going to be able to defend my thesis in time to make the August graduation deadline. That means I will still be in Milwaukee on August 14. Clarissa has made a few subtle hints about engagements and weddings. August 14 quits looking like such an ideal date. On July 10, I called up Jane to see what my options are. They still have the same diamond and band in the store. I decide that I want it. It was designed to be a proposal ring so that Clarissa and I could go back in later and select a different band and a wedding band to go with it. Jane finalizes the details, but the transaction must be paid for by the person who picks up the ring. That is inconvenient, but my mother agrees to pay temporarily so that she can pick up the ring for me. My mother picked up the ring on Tuesday, July 21. Clarissa was planning on visiting me the next weekend, and my mother always sends a paper bag or two full of food and mail for me. She slipped the ring in with a pair of flip flops for me in the bottom of the bag and covered the box with boxes of cereal. Clarissa picked up the bag from my mother and brought it to Milwaukee for me. I proposed that Friday night, and she never even knew she brought her own engagement ring to Milwaukee! FINALLY, after many visits to a bunch of fantastic venues, we have selected a reception hall! At first, Zachary and I weren’t sure what we were looking for in a reception hall, but as we saw more locations and what they offered, we began to get a better idea. We realized that not all halls would serve Zachary’s grandfather’s wine, which we really wanted to do. (Look for it at the wedding!) Also, I liked the idea of not having to decorate the hall too much. Since Zachary is in Milwaukee until December, I visited all of reception halls. Two people that really helped me were my mom and soon to be mother-in-law, Donna. My mom went to most of the reception hall viewings with me, and Donna went to all of them. (Natalie and Colette came to a few, too!) Donna also helped do an analysis of the different halls, so we could figure out which ones we liked best. One Sunday during church we decided to go to a movie and get drinks (so Chelsea and Ben couldn’t come). On August 14, 2009, we went to the Cladaugh for beers and then to the AMC to watch “The Dark Knight.” I had an idea that Zachary liked me, but wasn’t sure. Earlier that night I had decided to “check” and see if he liked me. While we were watching the movie, I leaned on the armrest of the theater seat to see if he would stay where he was or if he would move away. We sat with our shoulders together, whispering different thoughts throughout the movie. At the end of the movie, we stayed to watch the credits. There was a point in time when we were looking at each other and neither of us were talking… Then I looked away, and we decided to leave. I drove Zachary home that night and when we stopped in his driveway. He asked, “did I miss an opportunity in the theater?” I hadn’t quite heard what he said so I asked “what?” He quickly said, “nevermind” and opened the door to leave. What he said registered, and I said “wait!” We spent a little time talking and decided that it was worth chancing our friendship and start dating. Right before Zachary got out of the car, he kissed me on the cheek, and I drove home smiling.